© 2011 International Tent & Equipment Manufacturing, Inc. Premium Product Lines Manufactured By I.T.E.M. 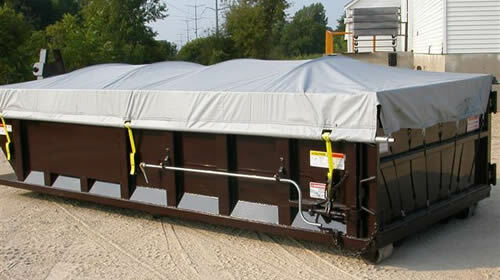 inc.
Utilizing today's industrial fabrics of all types and specifications. Featuring R.F. dielectric sealing , hot air welding and heavy industrial sewing. 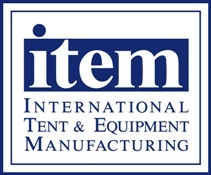 International Tent & Equipment Manufacturing, Inc.
I.T.E.M. produces a solid vinyl tarp to use when it's important to keep the contents dry. This system is designed to be installed on a container permanently. System features : steel or aluminum bow ribs and brackets, crank arm and roll tube, tarp roll stops and tie down ratchet straps. Optional aluminum front end caps available. Fabrics used are 18oz. and 22oz. vinyl coated polyester. The fabric is Dielectrically sealed together to remain waterproof and for durability. Hems around edges are reinforced with seat belt webbing and sewn with heavy, Bonded, U.V. treated polyester thread made for outdoor use. 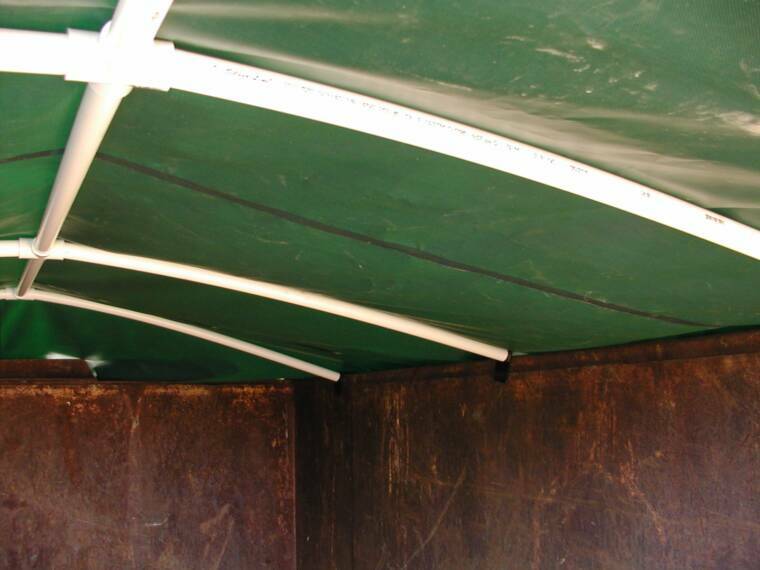 Water proof covering systems have become very important to protect the environment from runoff. I.T.E.M. uses only premium vinyl to insure long life and many years of use. Completely WATER PROOF, we offer this light weight and portable system in two weights of vinyl coated polyester, 18 oz is the most common and plenty heavy duty. 22oz is extremely durable and ex. heavy duty. Both are well suited for the job, the 22oz will have a longer life and stand up to rugged use and heavy debris better. Bracket & Rib Kit... Consist of; Steel brackets made in two sizes depending on the wall thickness of the container. ( Check Your Dumpster ) 3" thick side and 4" thick side. 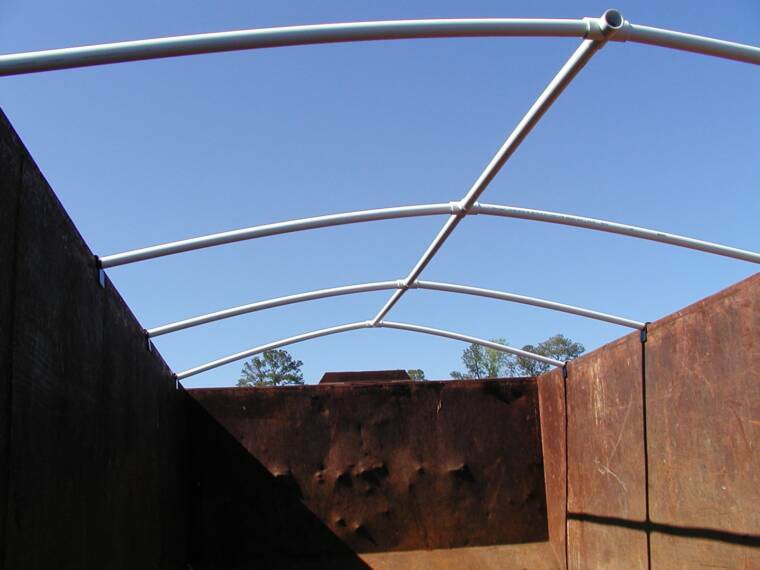 We recommend Ribs made from 1" Schedule 40 or Schedule 80 PVC pipe with a 4-way coupler in the center to accept spreader supports for increased stability. Schedule 40 and 80 PVC are both plenty strong enough and require no special fabrication to create an arch. Schedule 80 PVC is slightly more flexible than Schedule 40 but twice the cost. 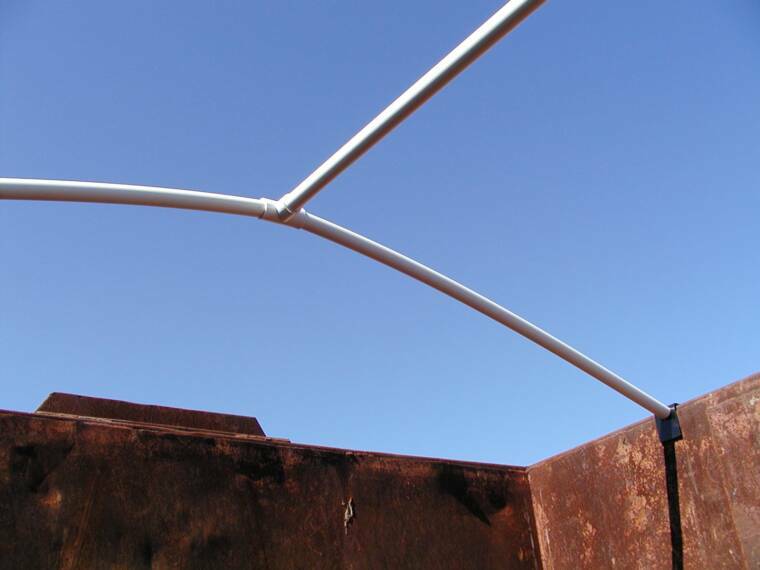 Our brackets will accept metal conduit pipe if necessary. 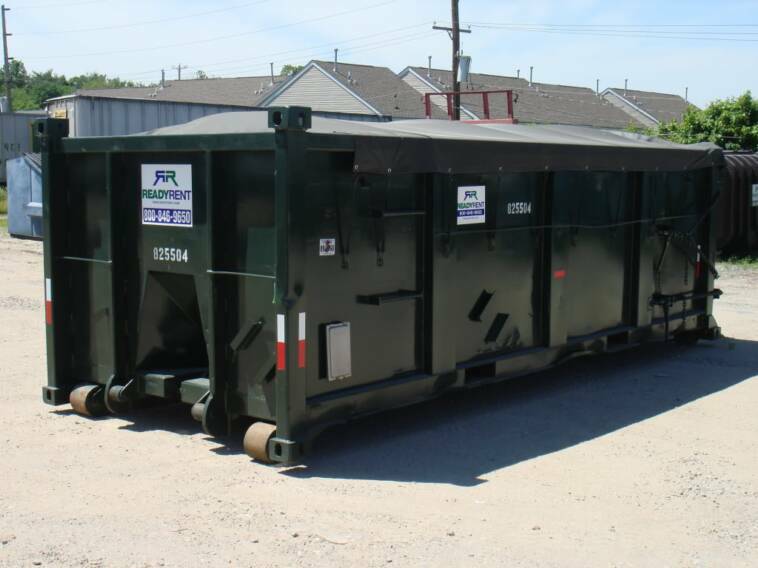 This Rib and Bracket System is installed in minutes and is easily removed when dumpster is ready for pick up. Designed to be completely portable from one container to another. 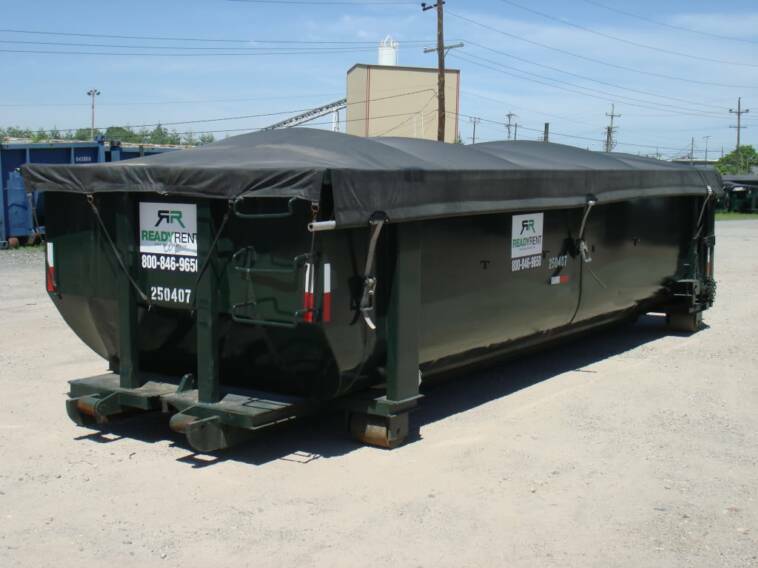 Perfect for rental dumpsters. *** Brackets are available in two sizes, Made to fit a 3" thick container side and a 4" thick container side. Standard complete kits or brackets only can be purchased in our Outlet Store.. Custom Orders and Price Quotes fill in form below. IF you would like a different color enter it here. Custom Request, Designs or Ideas.